There’s a little prep work upfront (chopping the veg and browning the meat) but once the fragrant sauce is gently bubbling on the stovetop you’ll feel a huge sense of accomplishment. Bonus, each time you come inside from shoveling, your home will smell like it’s been taken over by an Italian nonna. Growing up in the UK, my parents didn’t have money for lavish vacations but they were resourceful and my dad converted an old VW camper and each summer we’d head off to Italy for 6 glorious weeks. I’m kind of ashamed to admit that I was an incredibly picky eater as a child and I’d turn up my nose at slabs of authentic Italian pizza, refuse to eat any pasta I didn’t recognize and generally subsist on Coco Pops. 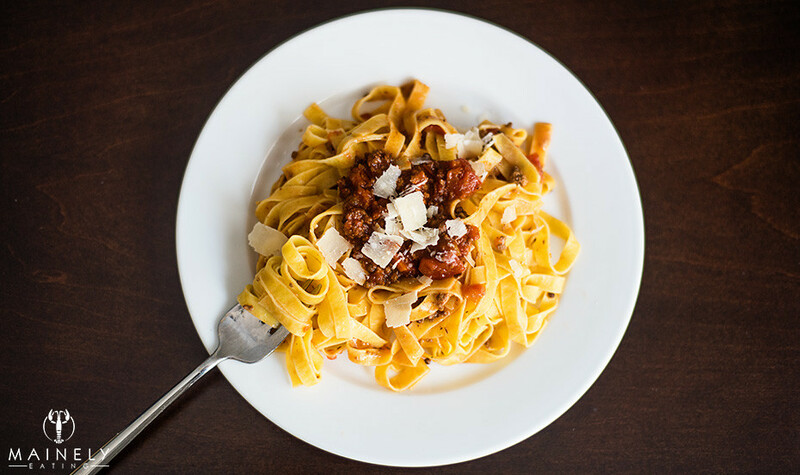 Once we returned home, my mum would regularly make this Bolognese sauce over the winter months to remind us that summer would be here before we knew it. Over the years I’ve made small adaptations to her recipe, mostly because I’m somewhat obsessed with the idea of boosting the umami in the dish. 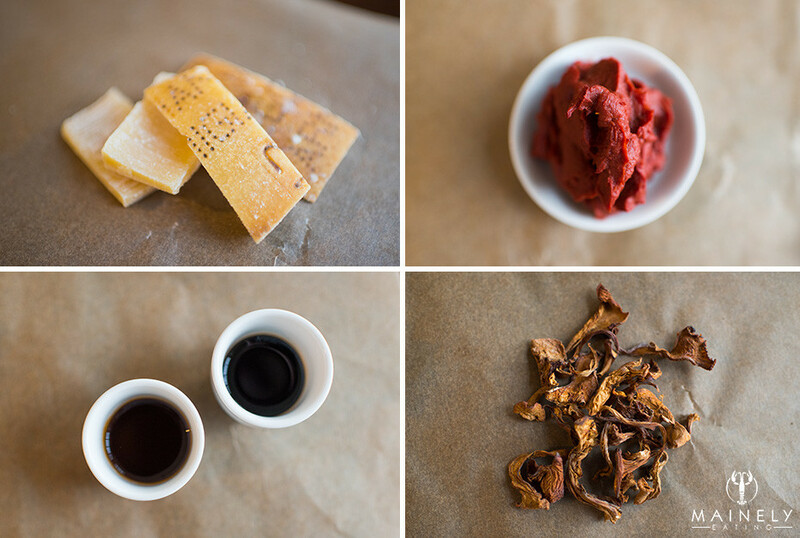 If you’re not familiar with the concept of umami, it was discovered to be the fifth taste by the Japanese. Umami is a pleasant savory taste imparted by glutamate, a type of amino acid, and ribonucleotides which occur naturally in many foods. Most people don’t recognize umami when they encounter it, but it plays an important role in making food taste extra delicious! Foods naturally rich in umami include beef, pork, carrots, tomatoes (is umami responsible for the popularity of tomato ketchup?!?!? ), mushrooms, soy, parmesan cheese (with crazy high levels of naturally occurring glutamate at 1200mg/100g of cheese). And guess what? 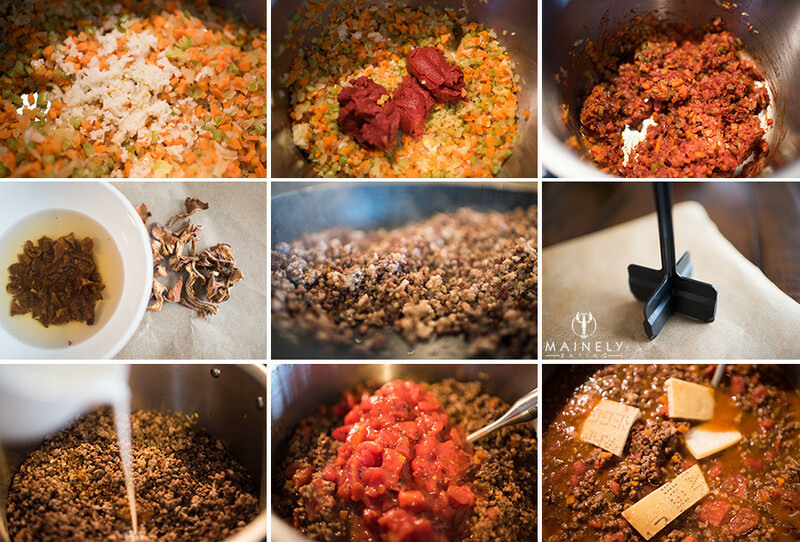 I’ve incorporated all of these ingredients into this Umami-rich bolognese sauce. I get out my largest 12qt stockpot and go to town, ending up with around 10 quart size baggies of sauce (perfect for 2 people) which I’ll lay flat to freeze and then stack on their sides in a freezer draw. One other note, a few months ago we bought the meat grinder attachment for the kitchen-aid, this has been life changing! I’ve never been the biggest fan of ground meat but the texture of home-ground meat vs. store bought meat is like night and day. Home-ground meat is almost fluffy in texture, it doesn’t clump or stick together plus you know exactly what you’re eating. I like to see what cuts of meat look good and maybe what’s on special but I always include some combination of beef chuck, pork and prosciutto or pancetta. Let’s get to it. Head out to the store where hopefully you can find all of the ingredients even if the shelves are empty of bread and milk, and spend your weekend making this sauce. The following recipe results in enough sauce for about 20 servings (10 meals for 2 or 5 meals for 4) but you can divide it by half if you’d prefer to make less. In a 12qt large stockpot, melt the butter and add the olive oil over a medium heat. Add the diced carrots, onion, celery and sauté for ~10 minutes, stirring occasionally until soft but not colored. Season with a little salt and pepper. Add the tomato paste to the vegetables, stir well to combine and lower the heat. In a separate large frying pan over a medium-high heat, start browning the meat (more umami boost!). The objective isn’t to cook the meat all the way through, just to brown so don’t crowd the meat or it will simply steam. If you’re using ground meat from the store then try to get rid of any clumps. Add each batch of browned meat to the large stockpot containing the vegetable/garlic/tomato paste. Low heat until all of the meat has been added. Feel free to drain off excess meat fat but you don’t want completely dry meat so make sure you add some. If your frying pan has browned/crispy bits, add a half cup of the red wine to deglaze and pick up this tasty fond and add to the stockpot. Turn the heat up to medium-high and pour in the milk. Stir frequently to ensure nothing sticks to the bottom of the pot. When the milk has bubbled away, add the two cans of diced tomatoes. Simmer the sauce for 3-5 hours, stirring it every time you pass by the stove. If it starts to look at all dry then add a cup of water. Towards the last 30 minutes, stir in the finely grated parmesan cheese. Remove the parmesan rinds (they’ll pop up when you stir the sauce), taste and adjust the seasoning with salt and pepper. To serve, cook your favorite pasta (I’m fond of thin fettuccine egg noodles), drain (always reserve a mug full of the cooking water!) and add back to the pan with a little butter. Toss with the Bolognese sauce (add a little of the hot pasta water to loosen things up) and shower with grated parmesan. Clumpy sauce is the worst. Home-ground meat doesn’t clump but often store-bought meat does. This “meat unclumper” can help (affiliate link)! The sauce inevitably tastes better the day after cooking once the components have had time to mingle and make friends. The sauce is perfect over spaghetti or fettuccine, as the basis for a lasagne, as a pasta bake when mixed with fusilli and topped with fresh mozzarella before a quick broil. 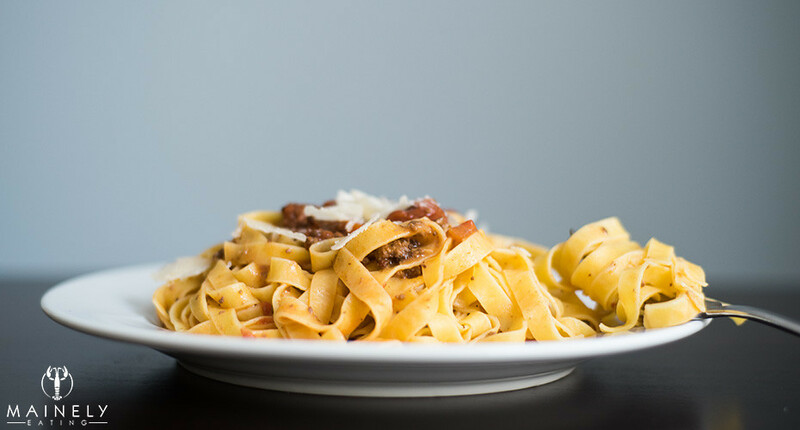 This entry was posted in Dinner, Entrees, Home cooking, Make Ahead, Pasta and tagged Bolognese recipe, Bolognese sauce, Ragu sauce, Umami, Umami rich Bolognese by Mainely Eating. Bookmark the permalink. This is a serious contenter for Cassie’s Sunday activity/challenge! 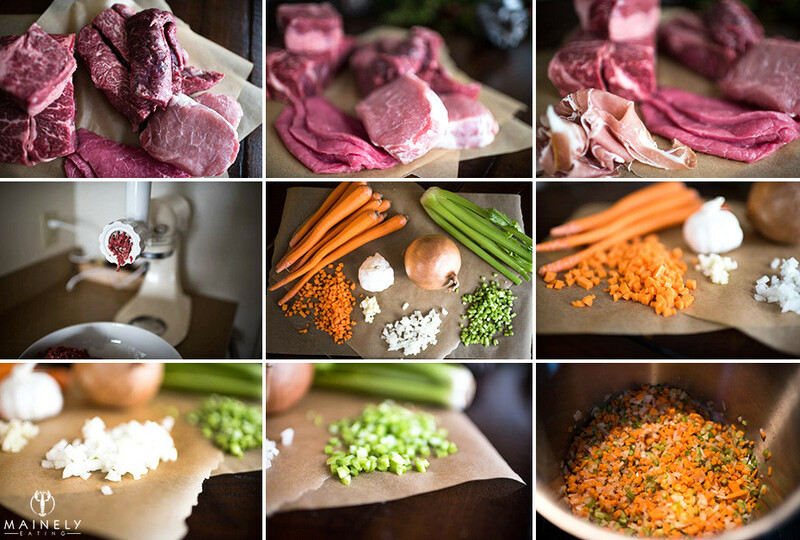 At step 11 when you add the wine, have you ever tried transferring it all to a slow cooker? Hi Cassie! I haven’t tried transferring it all to a slow cooker. Mostly because I tend to cook this in huge batches and I’d probably have to divide the quantities by half to fit in the slow cooker and also because it would make something else I have to clean 😉 but if you try it in the slow cooker I’d love to know what you think! Thanks for reading!